Tired of eating the same thing for dinner? This computer will invent hundreds of new recipes to suit your tastes, as long as you tell it what's in the fridge. Watson, IBM (IBM)'s artificially intelligent computer system that famously beat humans in the TV quiz show Jeopardy!, has taken up cooking. The idea is simple. 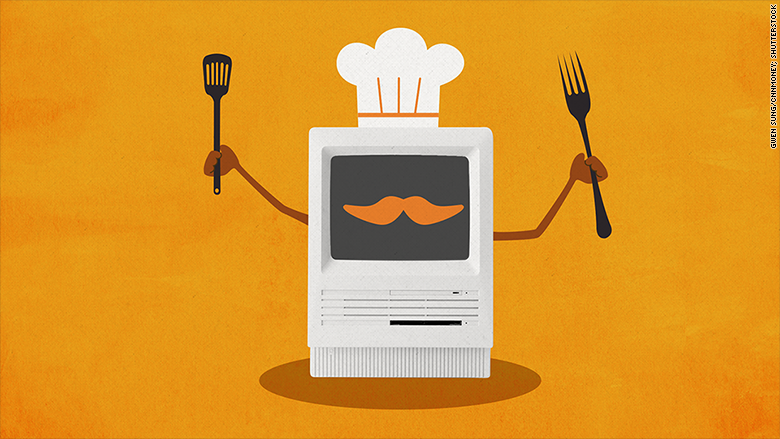 Users identify key ingredients and the type of dish they want, and Watson creates a recipe. IBM is working on a phone app but for now struggling chefs can try out the service by registering at Chef Watson. It scans thousands of known recipes to figure out patterns, using algorithms to pair ingredients and suggest which dishes would work. "You pick the kind of dish you like -- it could be a dumpling, a burrito, or you can remain vague and say you want it to be an appetizer," said Florian Pinel, a senior software engineer at IBM. Say you want a burrito. Watson will figure out it needs a wrap, vegetables, grains, and so on. The digital chef also takes into account information on taste and chemical compounds to find possible combinations that work well together. "If you said you wanted an Indian burrito with eggplant, it will focus on Indian ingredients that go well with eggplants," said Pinel. This kind of process is called "cognitive computing" -- meaning the computer is simulating human thought and gaining knowledge over time. Unlike humans, Watson can go through billions of pages in seconds. Since winning Jeopardy!, Watson has shrunk from the size of a master bedroom to three stacked pizza boxes and it is now accessed through the cloud. It's also learning from its mistakes. "Some foods have wedges, such as lemons. Raspberries, on the other hand, don't have wedges, and Watson had to learn you can't cut a raspberry into wedges," said Pinel. 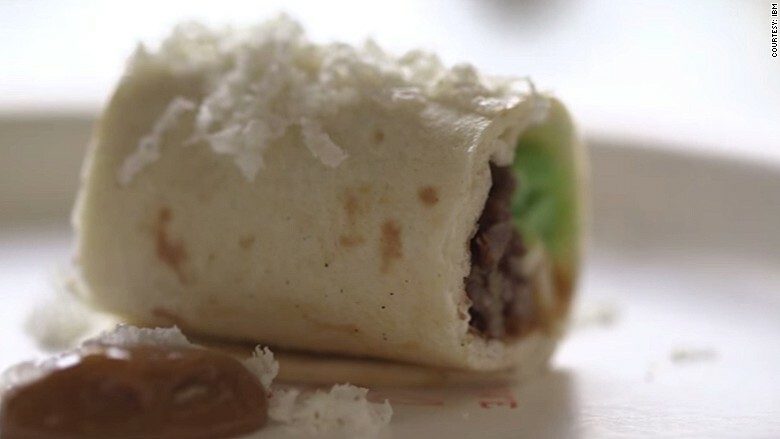 The recipe for this Austrian Chocolate Burrito was created by Watson. Brown the beef and drain. While still warm, stir in the orange zest, cinnamon, and 1 ounce of chocolate. Season with salt. In a saucepan, combine the apricot purée and vanilla and slowly reduce over medium heat. Remove from heat and stir in 1/2 ounce of chocolate. Next, blanch the edamame in boiling salted water for about 1 minute, then drain and shock in ice water. Transfer the edamame to a food processor and pulse to achieve a rough textured paste. Season with salt. Assemble the burritos by gently warming each tortilla. Put some of the beef mixture, mashed edamame, and edam cheese at the center and spoon over the apricot purée. Tightly roll and top with queso fresco and grated chocolate.